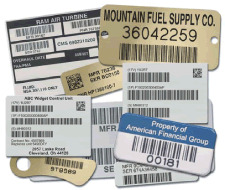 Metalphoto® is the preferred material for nameplates, control panels and bar codes where service life expectancy exceeds 20 years. Government and aerospace companies specifically request Metalphoto® for its resistance to weather, abrasion, heat and most chemicals. choice of matte, satin or #4 brushed finish. Resists most chemicals and solvents. The following performance requirements are taken from reference documents in which Metalphoto is used and specified, in order to demonstrate the unique durability of the product. The glass-clear, sapphire-hard anodized layer resists chemicals, paint, abrasion and dirt. 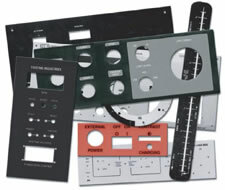 A unique, photographic imaging process creates ultra-high resolution graphics and text which are sealed inside of the anodized aluminum, providing corrosion, sunlight, abrasion, temperature and chemical resistance. The rigid aluminum base will not peel, crack or delaminate. For a more detailed explanation of the Metalphoto process, click here. 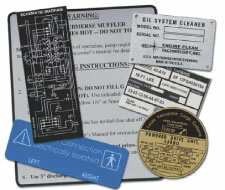 This unique layering in Metalphoto material makes it perfect for demanding sign environments. Metalphoto is specified by the government and the aerospace industry for its long life and ability to stand up to harsh environments. Below are Metalphoto's performance characteristics. See for yourself how well Metalphoto performs in your extreme environment. No pronounced image loss, degradation, or reduced readability after 7000 cycles of abrading wheel. 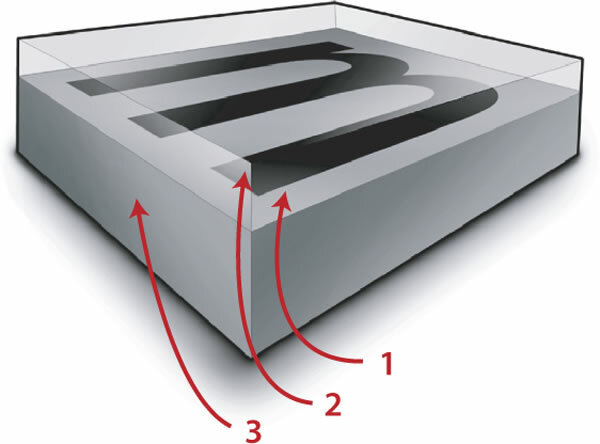 Heat Resistance No legibility loss or degradation when subjected to 1000°F. Corrosion No deleterious effect after a 720-hour salt spray (fog) test. 2.6 "very good" corrosion resistance after 113 days seawater exposure. Resistance No pronounced deterioration of legibility after 400-hour carbon arc weatherometer exposure. Oxygen Aging No discoloration or fading after 96-hour/300 psi/70°C oxygen bomb aging. Resistance No deleterious effects when tested with alkaline cleaners (MIL-C-87937 or equivalent) for aircraft structure. Resistance No deleterious effect or image fade after 1-hour at -50°F. No impairment of legibility upon exposure at -67° F.
Resistance No softening, staining, or noticeable fade after 24-hour exposure to: JP-4 fuel, gasoline, mineral spirits, methyl ethyl ketone, turpentine, turbine & jet fuel, kerosene, xylol, acetone, toluol, heptane, trichlorethylene, MIL-H-5606 hydraulic fluid, and MIL-L7808 jet engine oil. Resistance Visual reading of "0" per ASTM-G21. Thermal Shock No deterioration after 3 cycles between -65°C and 125°C. Resistance No deterioration after 10 humidity cycles per MIL-STD-202, method 106. Metalphoto ® is a registered trade mark of Horizon Inc.
For a list of Mil Specs click here. 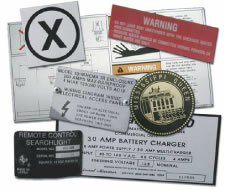 Metalphoto signs are ideal for situations where most other signs will not hold up. Salt water, sun, abrasion, heat, or corrosion, Metalphoto will endure in any of these conditions. There is a reason the government specifies Metalphoto for any demanding application. Contact our Tacoma customer service department or our Seattle Advance Marking and Sign customer service department with any questions about our Metalphoto products.